A stepper motor turns in discrete steps, so that it’s rate of turning can be controlled very precisely. Some stepper motors turn very fast (they are found in disk-drives, 3D printers and medical imaging devices, to give a few examples), but they also can turn very slowly, which is something most other motors have a hard time doing. Because of this ability to turn slowly, steppers work well as clock motors. This project demonstrates this use with a unique clock project. 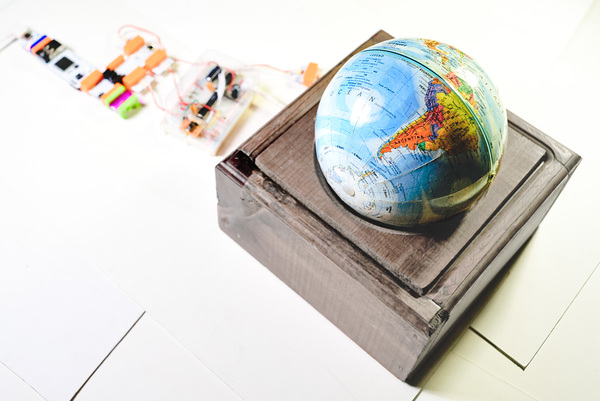 The stepper motor is geared down so that it spins a globe exactly one revolution per day, the same rate that the Earth spins. Each day takes nearly 18,000 steps, or one step every 5.05 seconds. External factors, imprecise calculations, and other issues affect the position of the globe, so the clock resets it’s position as needed. The cloudbit provides a time signal to initiate setting the clock. In order to position the clock, the absolute position of the globe must be known. This is accomplished by including a magnetic switch in the design. The globe is housed in a wooden box. It spins sideways, so the time is read by looking down at the equator of the globe to find the longitude where it is noon. Other times are derived by subtracting the time zone from the indicated position.